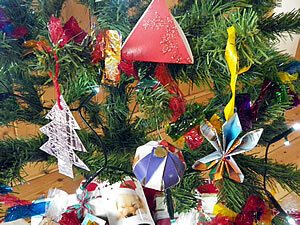 Bring the whole family to Carymoor Environmental Centre, Castle Cary on Saturday 10th December between 2.00pm and 4.00pm for some Crafty Christmas Fun! Christmas can be so busy that we sometimes forget to make time to enjoy this special time of the year. Come and spend the afternoon having fun with your children creating Christmas decorations for your home and tree from both natural and scrap materials. Activities are suitable for children of all ages, and for their parents too. The Centre will look its festive best, decorated with berries and leaves collected from our Nature Reserve. Light refreshments will be on sale in our education centre. We are expecting this event to be well supported so book your place well in advance. Please call 01963 351350 to book a place or email . There will be a small charge of £7 per family (up to 2 adults and 2 children) plus £2 for each additional participant, which includes all the materials you need to create your decorations. For information on all of Carymoor's events see the What's On page of our web site or follow us on Facebook.